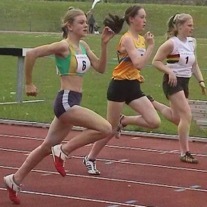 Carley joined the club from Dursley AC when she decided she needed more opportunity to compete on the track. A stylish sprinter, she had good form across distances from 100 to 800 and was soon making her presence felt in club competition. Under the guidance of Glory Wassell she established a good record in the sprints up to the age of 16. Carley joined Graham Howell’s sprint group when Glory Wassell retired in 2004. Her final U17 year was spent concentrating on English Schools selection for 300m, but although she achieved the entry standard she was inexplicably overlooked by Gloucestershire schools.